VIRGIN RIVER GORGE – Motorists passing through the Arizona stretch of Interstate 15 are advised to plan ahead and be prepared for slow travel though the Virgin River Gorge Monday through Wednesday. The Arizona Department of Transportation announced Thursday that starting Monday, at 9 p.m., work crews will begin a concrete deck pour as a part of the work being done on Virgin River Bridge No. 6, located in the area of milepost 16. Highway speeds will be reduced to 25 mph through the work zone while the deck pour takes place and the concrete sets. This portion of the bridge work will conclude by 9 p.m. Wednesday. Along with allowing up to an hour of additional travel time through the Gorge, motorists are advised to be aware of additional construction equipment, crews and law enforcement in the work zone. The concrete deck pour is a significant milestone on a $27 million major reconstruction project that began in 2014 and includes the replacement of the bridge’s superstructure (girders, deck and railings) as well as widening the roadway through the narrow passage of the Gorge. The highway is currently narrowed to one lane in each direction through the work zone until the project is completed in 2016. Those seeking to avoid the construction work in the Virgin River Gorge may take Highway 91 as an alternative route. 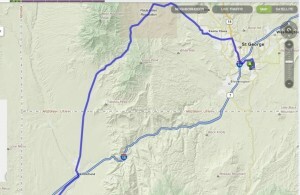 The highway bypasses the Gorge entirely, intersecting with I-15 at Littlefield, Arizona, to the south and connecting to St. George at the north via Santa Clara and Sunset Boulevard. See map included in this article. No matter which route motorists choose, obedience to traffic laws and posted speed limits is advised in order to avoid becoming acquainted with Washington County Sheriff’s deputies or Arizona Department of Public Safety troopers under unfavorable circumstances.